The Newcastle Christmas Tree Festival has been happening every year since 2009, taking place one Saturday in early December. Each year History-for-kids enters the competition. Find out more about it here, and there is an interview with one of the organizers, Lesley Dinning. The 2016 festival is on Saturday 3rd December 2016, with viewing and voting from 11am to 4:30pm. Then at 5:00pm there is carol singing surrounded by the trees. The winning trees will be announced during the carol singing. Decorate a tree as an individual, a group or a business, using any theme of your choice. Open to all age groups. Prizes for the best trees in the show - chosen by visitors to the festival! HfK: What is the festival all about? 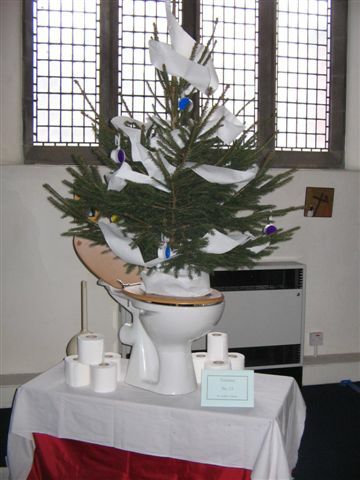 LD: It's really just for fun - we decorate the church with lots of Christmas trees - each tree with its own theme. The church is open all day for people to come and have a look around. Some of the trees are pretty, others are really funny - there are some imaginitive people out there. Originally it was intended to be a one-off, but by popular demand, we have been doing it every year. People seem to love the idea, and love the display. HfK: Where do the trees come from? LD: From the local community - local shops, businesses, schools, hotels and individuals, all take part. We had 27 trees in the first year, but this year we are expecting about 40. HfK: Does the festival raise any money? LD: It does raise a little, which is used to help maintain the Church. Also, a collection in aid of Shelter is taken during the carol concert. Admission is free though, all donations are voluntary. HfK: What sort of themed trees can people expect to see? LD: In the past we have had "Diving into Christmas" by Jesmond Baths, "O Fishmas Tree" by The Fish Shop. This year we have some really great ones too - all top secret until the 3rd December though! HfK: Thanks for talking to us. I hope it goes well. Nobody knows for sure the truth behind the history of the Christmas Tree, but one possible story is that it started with pagans in Germany, who worshipped the oak tree. When Christianity arrived these pagans still wanted to worship a tree, so the priests suggested the pine tree - it is a triangle shape with the three points representing the father, son, and holy spirit. By the 12th century fir trees were being hung, upside-down from ceilings at Christmas time in Central Europe, as a symbol of Christianity. The first decorated Christmas tree is believed to have been in 1510, at Riga in Latvia. Martin Luther is said to have decorated a small Christmas Tree with candles, to show his children how the stars twinkled through the dark night. The first Christmas Tree in Britain was put up at Windsor in 1800, by Queen Charlotte, wife of King George III. Charlotte was from Germany. The Christmas Tree did not become popular with the masses until Prince Albert (Queen Victoria's husband, and another German) had one put up 40 years later. In 1879 an American , Frederick Artz, invented a candle-holder with a spring clip that could be attached to a branch of the tree. It was made of tin, with a little cup at the bottom to catch the melted wax. It became very popular and can still be bought today. Victorians cleverly made their candles spiral. This meant the melted wax ran down through the grooves without dripping. If you have a photo of a great Christmas tree that you took at the Newcastle Christmas Tree Festival, then please send it to us, and we will share it with the world. Your comment will appear on a Web page exactly the way you enter it here. You can wrap a word in square brackets to make it appear bold. For example [my story] would show as my story on the Web page containing your story. Row-Row-Row your boat Gently down the stream Merrily Merrily Merrily Merrily Life is but a tree. 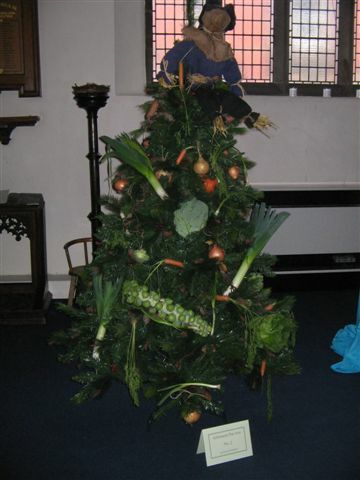 This tree was very popular, and it was the 2011 runner up in the individual competition. Yes, it's toast. The base is a toaster. 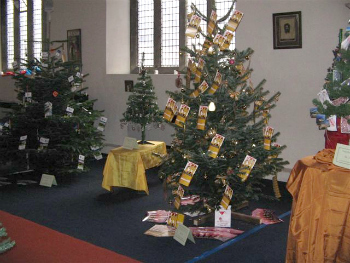 If you are interested in entering a tree in the 2012 Newcastle Christmas Tree festival, you can contact us and we will pass your message on to the organizers. I promise to use it only to send you News from History-For-Kids.com.